At the Fordham Graduate School of Education’s January 9, 2018 information session, GSE Dean Virginia Roach welcomed prospective students. She began her remarks by sharing Fordham’s commitment to the Jesuit principle of cura personalis, or a deep respect for the individual and his or her potential. 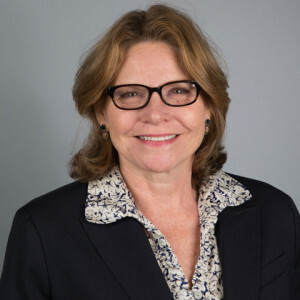 Dean Roach noted that because adherence to this concept means that students are revered and respected as individuals, GSE faculty offer a unique approach to graduate education. In part, this approach challenges scholars to strive for ever-greater personal excellence in all aspects of life — intellectual, emotional, moral, and physical. More specifically, Roach noted that cura personalis also includes the faculty’s dedication to individual mentoring and small group instruction. Faculty members support students throughout their experiences in the GSE, from the time they enter the school to begin their graduate studies to when they graduate to join the workforce or engage in further study. Throughout a student’s Fordham GSE education, faculty emphasize extensive learning, gaining wisdom of practice, strong commitment to social justice, accepting and fostering diversity, and serving with and for others. 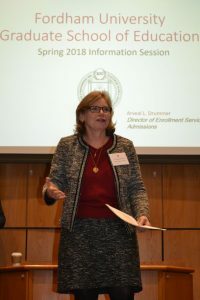 Arveal Drummer, GSE Director of Admissions and Enrollment Services shared that Fordham University has been educating leaders since 1916 and is ranked among the top 50 U.S. graduate schools of education by U.S. News & World Report. Drummer also noted that Fordham’s GSE is nationally accredited by the National Council for Accreditation of Teacher Education (NCATE), and offers both full and part time class schedules at the Lincoln Center and Westchester campuses. Information session attendees then went to follow-up breakout sessions with faculty to discuss details regarding the available six program areas: Administration & Supervision (Doctoral, Masters and Certification) K-12, Urban, and Executive Leadership; Curriculum and Teaching; Counseling Psychology; School Counseling; School Psychology; and Mental Health Counseling. Visit the Fordham University Graduate School of Education website at www.fordham.edu/gse, https://gradadmissions.fordham.edu/apply/, for additional program information and requirements, prospective student information, an online application, and the GSE bulletin.